Found one file extension association related to Mono/Poly and 1 file format developed specifically for use with Mono/Poly. Mono/Poly is Korg’s four-VCO monophonic/polyphonic synthesizer that went on sale in 1981 and was considered the culmination of Korg’s experience building analog synthesizers. 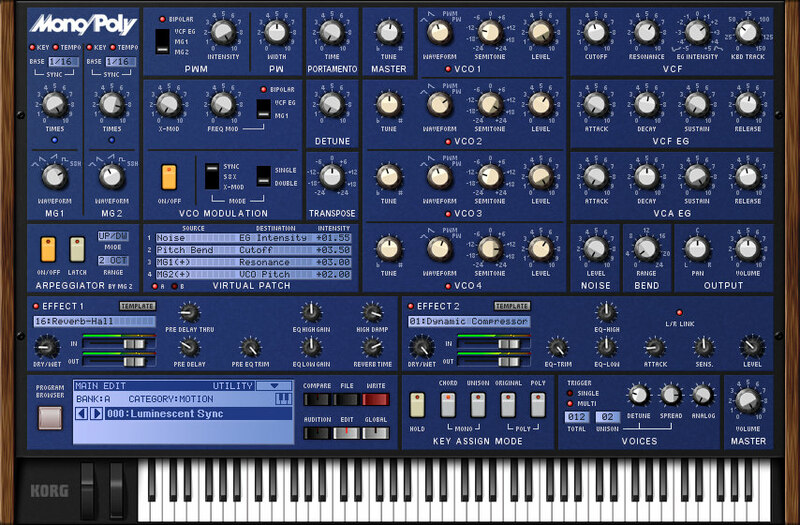 It was released at the same time as the Polysix, and because of their capabilities as well as their price, these two instruments caused a revolution in the synthesizer world. Many musicians acclaimed the Mono/Poly as Korg’s best synthesizer yet, with a number of unique characteristics. It provided four VCOs, each providing adjustable pitch, waveform, octave, and level, which could be stacked together for massive sounds, or cycled through one at a time for constantly shifting timbres. Together with one VCF, one VCA, two EGs, and two MGs it provided a powerful yet accessible programming structure. But by far, its most signature characteristic was the Synchro and Cross Modulation functions that could run dual, or four-way cascaded modulation routings for creating revolutionary and aggressive tonal effects. It also featured the same futuristic Chord Memory and Arpeggiator functions as the Polysix. This diversity of parameters could be used to create an incredible universe of sounds ranging from thick and rich to sound-effect-like. If you need more information please contact the developers of Mono/Poly (KORG), or check out their product website.